Salade Lyonnaise at Aix en Provence. Layering is as essential in French cuisine as it is in fashion. French dishes -- from haute cuisine to humble regional dishes -- are built to let flavors unfold. Somehow, though, this innocent concept became dominated by old-school Escoffier-inspired hotel restaurants with white linen tablecloths and confusing specialized utensils. Really -- a fish knife? The French restaurant became a special occasion place. Even though bistros pushed back from this concept, French dining is often seen as a bit too pretentious and posh. It's hard to argue with the taste of folks who start their day with café au lait and a chocolate croissant. But there is still much bashing of French cuisine. Years ago, 1998, in fact, the then New York Times restaurant critic Ruth Reichl was a bit harsh in her comments on the cuisine in Provence. She strongly rejected the romanticized version of that region Peter Mayle offered a few years earlier in his 1991 book A Year in Provence, a place where eateries served wines from local coops and the town markets were bursting with local fruits, vegetables, cheeses and olives. So maybe you can't go back to the Provence of youthful wanderings. But I'll forgive a white tablecloth in a bistro, if I can have the perfect dish to welcome spring: Salade Lyonnaise. 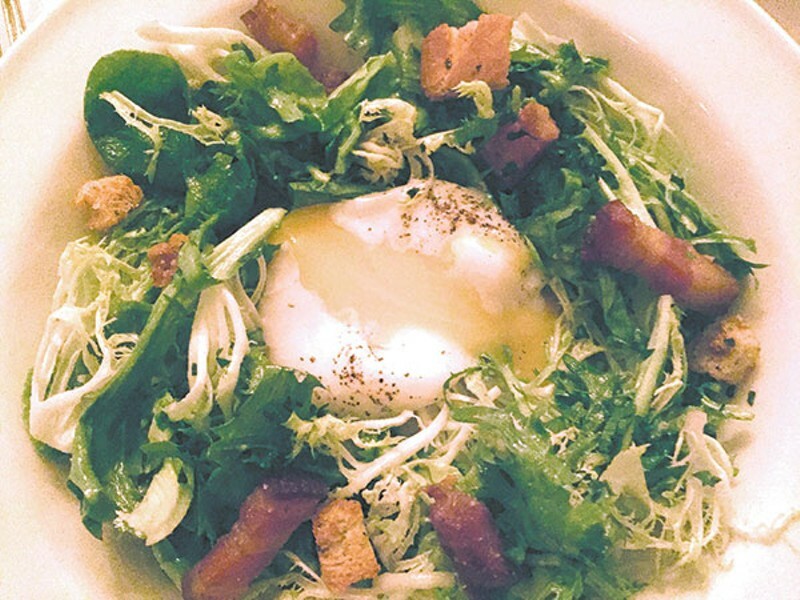 This is not a simple salad: bitter greens studded with lardons and bathed in the warm yolk of a precisely poached egg. I found this perfect harmony of tangy, bitter, salty and smoky at Aix en Provence, a new bistro in Myers Park. And who better to perfect this salad than someone from Lyon, where the salad originates, Patrick Garrivier. In late December, Garrivier and co-owner Bryan St. Clair, a native Charlottean, opened their 57-seat "Mediterranean Bistro." At the helm of the kitchen is Chef Nicholas Tarnate who has done stints with local chefs Blake Hartwick, Marc Jacksina, James Stouffer and Tom Condron. Aix's menu is seasonal and focuses on dishes from the western Mediterranean, primarily French, together with dishes from Spain, Morocco and Italy. Among the spring starters are escargot in puff pastry, foie gras, and frog legs. But I'll steer you towards the restaurant's brilliant take on octopus. "This is better than the wood grilled octopus on Santorini," my dining partner noted. High praise, deserved. Main courses are uniformly generous, and sharable including pasta-style creations like the tagliatelle with lamb ragout. The Scottish salmon is punched up with fennel, artichokes a la barigoule and a basil aioli. There's an Aix variation of steak, seared quickly to ensure chewy tenderness and audibly crunchy frites, mais bien sûr. The dessert specialty is a solidly professional chocolate soufflé. Or there's cheese. Or liquor. The wine list is primarily French with a few Spanish and Italian wines. Aix en Provence décor is self-consciously rusticated in a Myers Parker sort of way; the cheery wait staff is spot on in service; and the cooking feels like it's from the heart with old favorite charmers and natural farm goodness. Bienvenue.